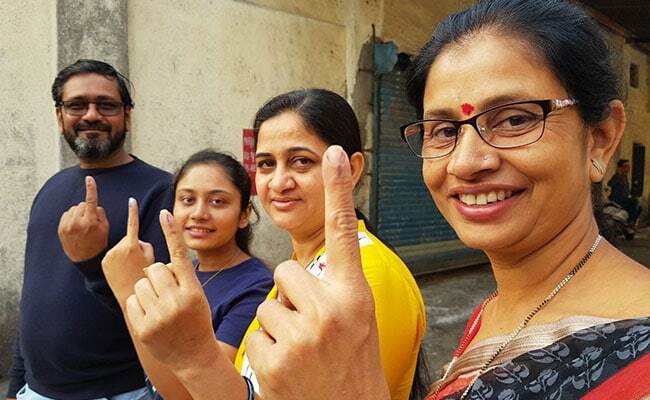 The first phase of the Gujarat assembly election saw a voter turnout of 68 per cent as voting ended at 5 pm, Chief Election Commissioner AK Joti told reporters, adding the Election Commission expects the final turnout to reach the last election's figure of 71.3 per cent. The first phase of polling was held on 89 assembly constituencies in Saurashtra and south Gujarat regions. The voting turnout till 4 pm was over 60 per cent, according to the Election Commission. The voter turnout then climbed to 68 per cent by the time voting ended. A total of 977 candidates fought it out in the first phase of the Gujarat polls in Prime Minister Narendra Modi's home state. Prominent candidates are Gujarat Chief Minister and BJP's Vijay Rupani (Rajkot West), and Congress's Shaktisinh Gohil (Mandvi) and Paresh Dhanani (Amreli). The Bharatiya Janata Party has been in power in Gujarat for an uninterrupted 22 years. The BJP is looking to stay in power for a fifth term, and the Congress is also hoping for an electoral revival. Both Prime Minister Narendra Modi and Congress vice president Rahul Gandhi ran a high-decibel campaign ahead of the Gujarat polls. According to the Election Commission, 2.12 crore people were eligible to vote in the first phase of the election in Gujarat. 126 year old Ajiben arrives to cast her vote in the first phase of Gujarat assembly election in Rajkot on Saturday. 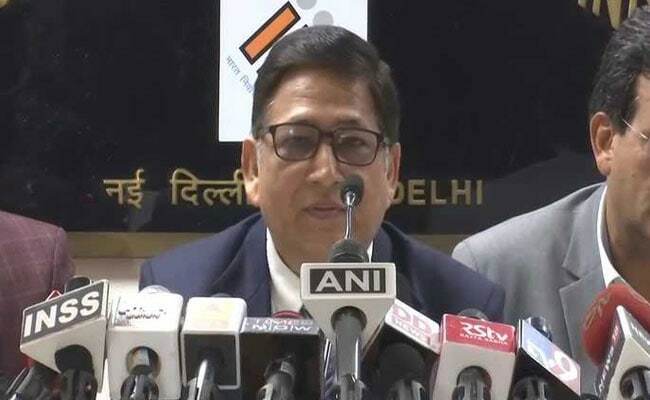 Chief Election Commissioner, AK Joti, speaking at a Press Conference after polling said that there were 2.8 crore voters were eligible to cast their vote in the first phase that saw an approximate 68% voter turnout. As the Election Commission announced a voter turnout of 68 per cent in the first of the Gujarat assembly election today, Prime Minister Narendra Modi thanked the people of his home state for turning up in a large number to vote. "Thank you Gujarat! 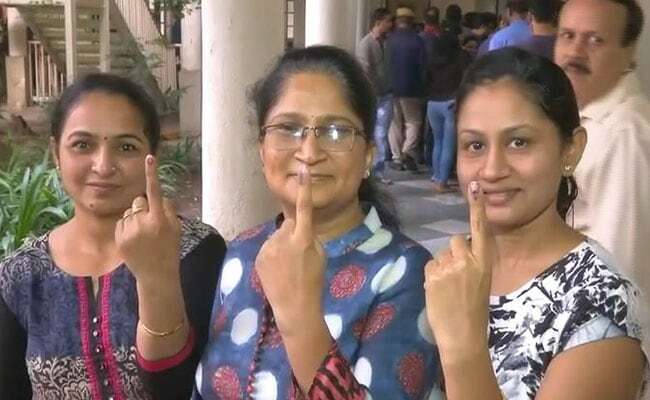 Gratitude to my sisters and brothers of Gujarat for voting in record numbers today. I am seeing that BJP is headed towards a historic victory, powered by the affection and support of every Gujarati," Prime Minister Narendra Modi tweeted. "For first time, EVMs and VVPATs were used in all constituencies and also for the first time all voters with disabilities were mapped," Chief Election Commissioner AK Joti told reporters after voting ended in the first phase of the Gujarat assembly election 2017 today. He said tentatively 68 per cent voter turnout has been recorded as voting ended at 5 pm. In the last election, it was 71.3 per cent. "Hopefully final figure will touch previous election's figure," he said. On EVMs that malfunctioned, Mr Joti said, "Overall number looks large but as proportion of total, much less machines were found faulty. They were replaced." 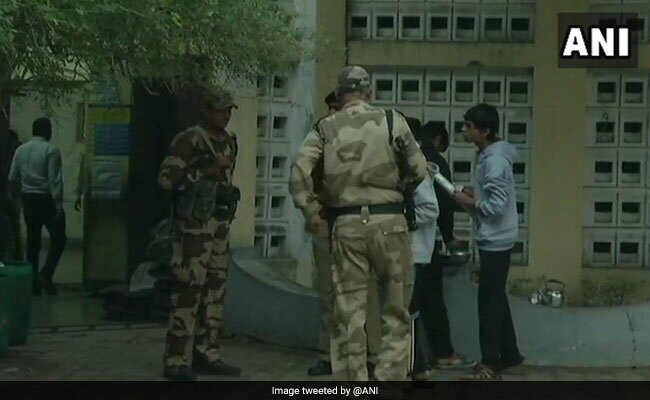 Electronic voting machines or EVMs and voter-verifiable paper (VVPAT) trails are sealed after the first phase of Gujarat assembly election ended at a polling station in Rajkot. "The poll process of the first phase of elections passed peacefully and incident-free," Chief Election Commissioner AK Joti said in a news conference today after voting in the first phase of the Gujarat assembly election ended at 5 pm today. "I would like to thank media for wide coverage and incessant work in voter awareness," he said, adding "The Election Commission had appointed 57 general observers and 39 expenditure observers..."
"We express more than satisfaction in the manner in which the election has been conducted," Finance Minister Arun Jaitley told reporters after voting in the first phase of the Gujarat assembly election 2017. 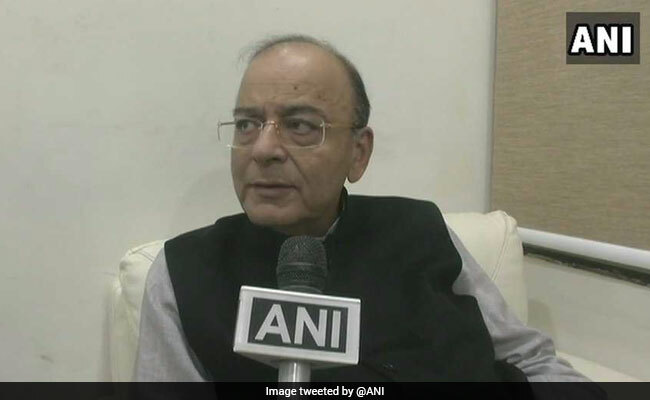 On Congress's allegations that the EVMs failed in some places, Arun Jaitley said, "These are just baseless statements. When statements of these kind are given, I can't help but say that these are preparation of upcoming defeat." As the first phase of the Gujarat assembly election 2017 ended, Finance Minister Arun Jaitley credited the Election Commission for conducting a peaceful election. "First phase of polling has ended. We are extremely grateful to EC, the officials and voters for peaceful and successful completion of voting. 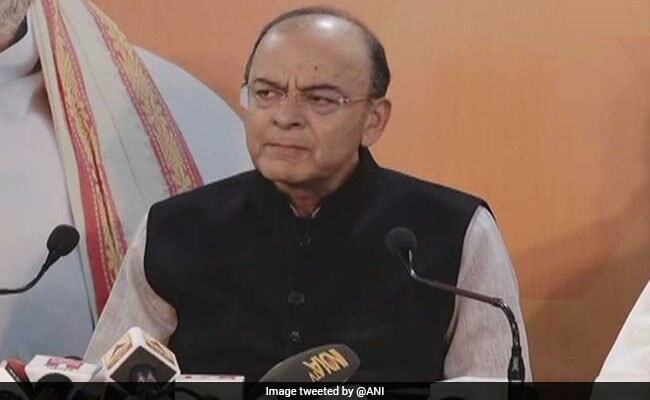 I'm sure, as per the reports that are coming, that BJP is going to register a landslide victory," Arun Jaitley told news agency ANI. "BJP estimates that we will not only get a comfortable but a landslide win. In most places people of all sections have supported the BJP. Early reports are encouraging for us. BJP has got great support in this phase," Arun Jaitley told reporters. "There were no big incidents during the election; some places had problems with the EVMs but that's normal in an election of this scale. They were rectified later." 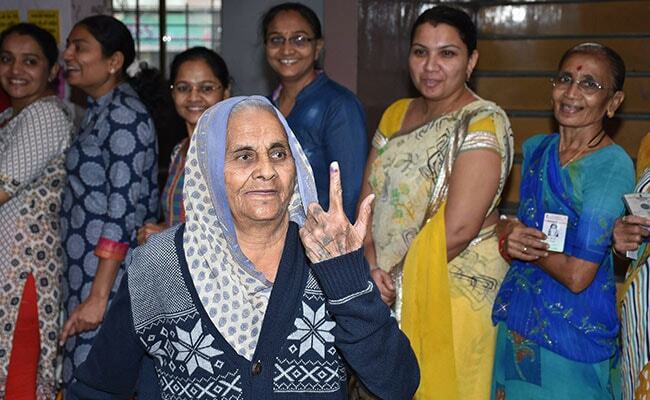 The All India Radio today shared a picture of 106-year-old Motli Ba with indelible ink impression on her index finger after casting her vote in the first phase of the Gujarat assembly election 2017. Motli Ba is among the senior-most voters in Gujarat who witnessed the historic Dandi March of 1930 that was led by Mahatama Gandhi as part of the Civil Disobedience Movement. 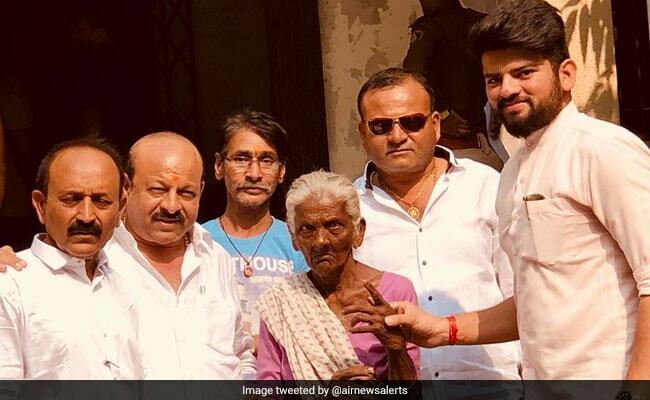 The All India Radio tweeted, "106 years old Motli ba casts her vote in Surat, She is living witness of #MahatmaGandhi's historic #DandiYatra." People pose for photographs at a stall set up and decorated by the Election Commission in Bhavnagar to raise awareness about the importance of casting votes, news agency ANI reported. 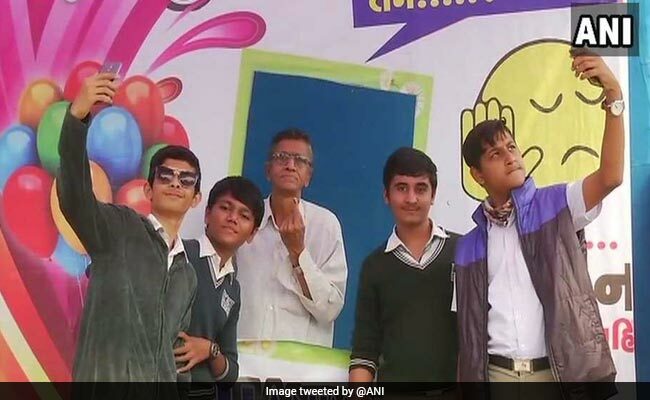 Many people took photos at the 'selfie point' at the polling station on the first phase of the Gujarat assembly election 2017. The Election Commission has released data on the electronic voting machines or EVMs used in the first phase of the Gujarat assembly election 2017: ballot units (26,865), control units (24,689) and voter-verifiable paper audit trail or VVPAT (24,689). 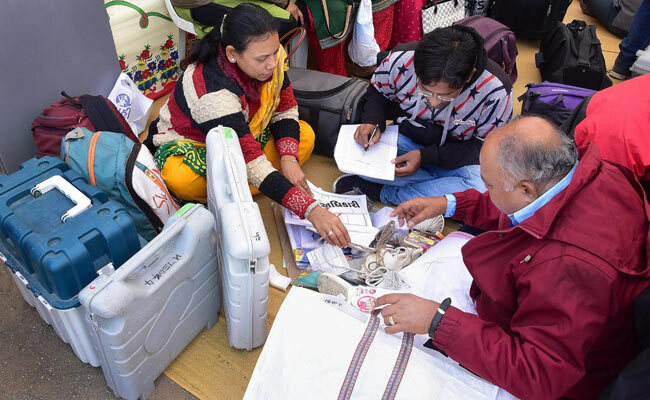 During polling, the percentage of the units replaced are: ballot units (0.37 per cent), control units (0.38 per cent) and VVPAT (1.90 per cent). People from all walks of life came out to vote in the first phase of the Gujarat assembly election 2017. 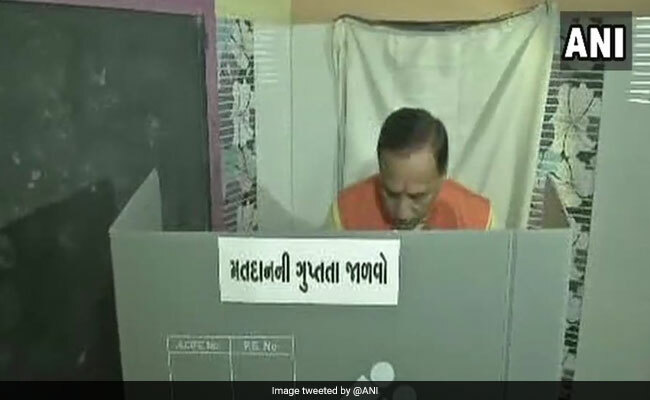 Chief Minister Vijay Rupani, contesting from Rajkot West, was among the early voters in his constituency, news agency PTI reported. 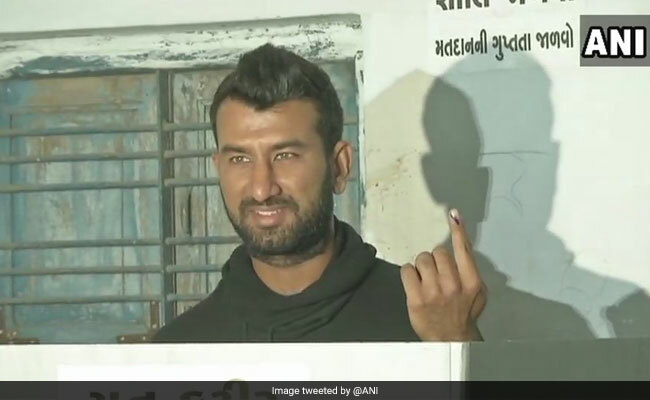 "I have cast my vote and would appeal to all voters to come out in large numbers and exercise their democratic right," said cricketer Cheteshwar Pujara as he emerged from a polling booth in Rajkot. He was accompanied by his father Arvind Pujara. 115-year-old Ajiben Chandrwadia voted at a booth in Upleta town of Rajkot district. Another centenarian, a 104-year-old woman, voted in Morbi district, accompanied by her family members. 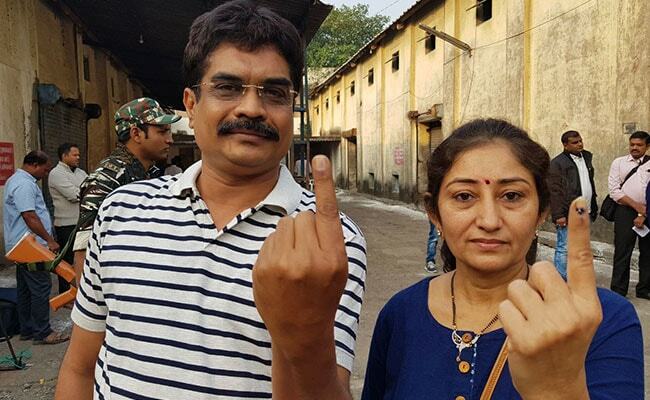 Two voters show their inked fingers outside a polling station in Surat. 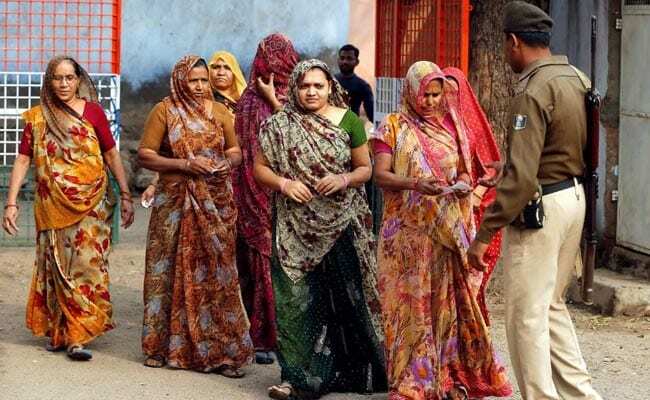 The highest voter turnout of 38.07 per cent was recorded in the tribal-dominated district of Tapi, while Narmada, another tribal-dominated district in south Gujarat, recorded the lowest turnout of 25.67 per cent in the first phase of the Gujarat assembly election 2017, news agency PTI reported. 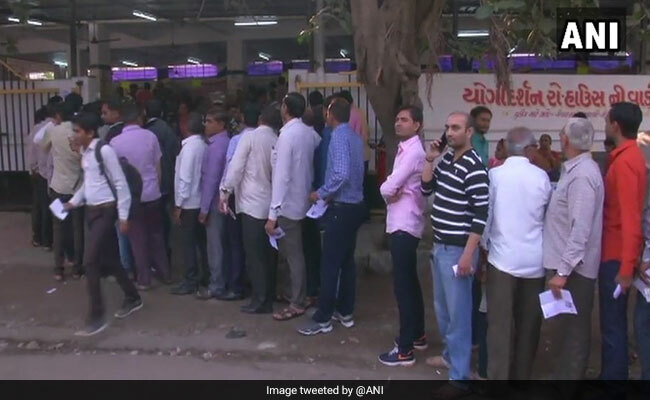 Chief Electoral Officer for Gujarat BB Swain said that though voting would end at 5 pm, those standing in queue outside polling booths before the process ends, would be given a chance to cast their votes, PTI reported. 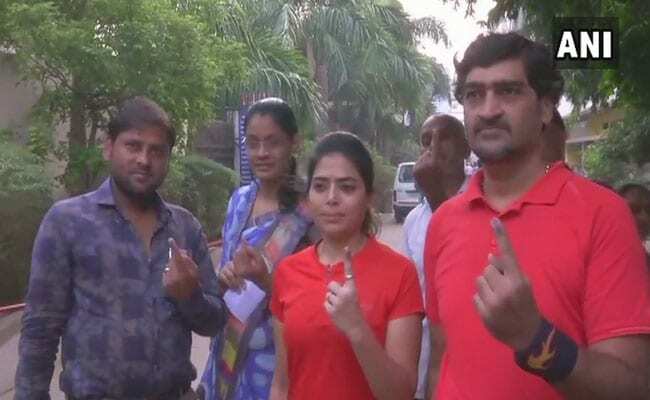 A team of Election Commission officials have reached a polling booth in Thakkar plot, Porbandar, after receiving complaints of EVMs being connected to Bluetooth, news agency ANI reported. Earlier in the day, some electronic voting machines in seven-eight polling booths had malfunctioned in Surat too. They have been replaced, the Election Commission said. 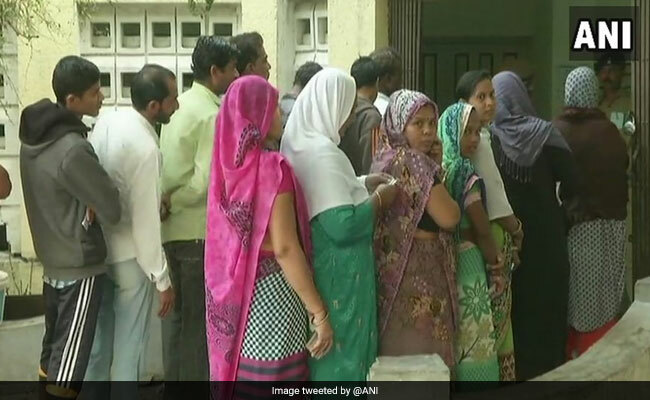 "There are 24,000 polling booths in Gujarat, the problem has occurred in seven or eight booths," Chief Election Commissioner Achal Kumar Joti told NDTV. "We have a number of EVMs in reserve. Concerned officials keeping continuous check," he said. The Election Commission said all electronic voting machines or EVMs that malfunctioned in Surat have been replaced. Other officials are also reporting that it was not a major issue. "There is no issue. At few places where machines had problems, that has been resolved. Machines have been replaced wherever required. 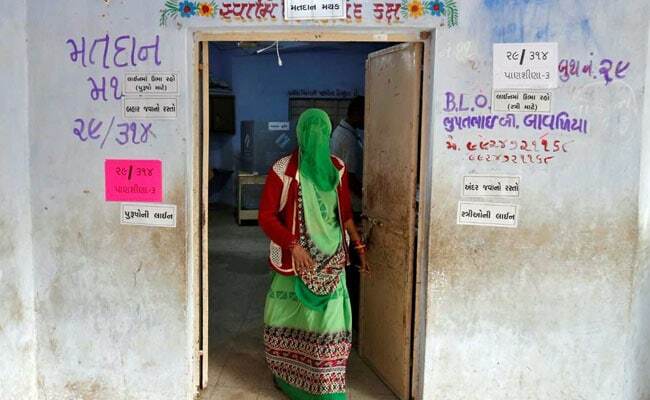 Polling is going on peacefully," said Harshad Patel, Bhavnagar District Collector, news agency ANI reported. 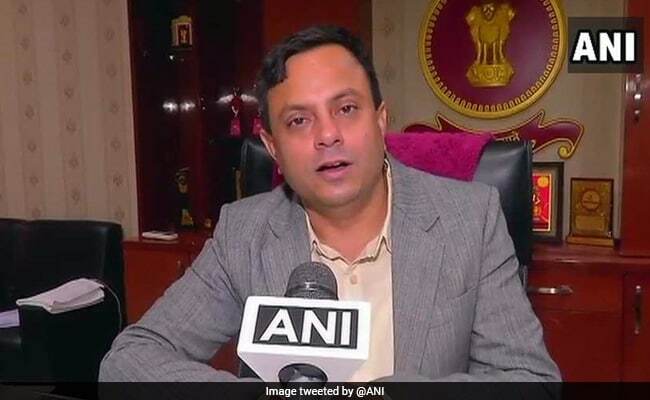 After some EVMs malfunctioned in Surat in the Gujarat assembly election 2017, and Congress leader Amhed Patel said "there are reports of EVM malfunctioning in several polling stations," the BJP has responded. "Congress party has made it a practice to say EVM malfunctioned every time when they face defeat. 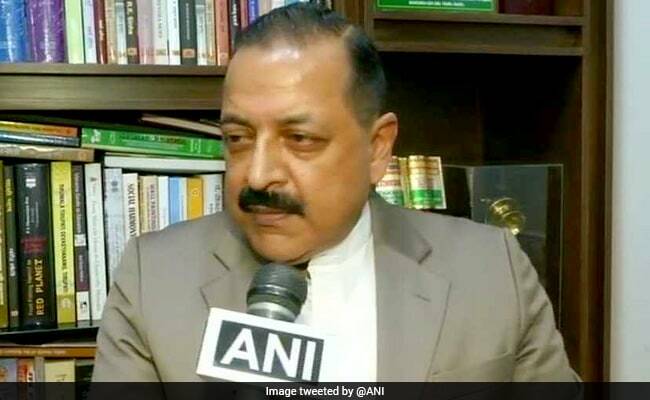 Therefore, they are preparing ground before December 18 to blame their defeat on EVM," Minister of State in the Prime Minister's Office Jitendra Singh said, news agency ANI reported. 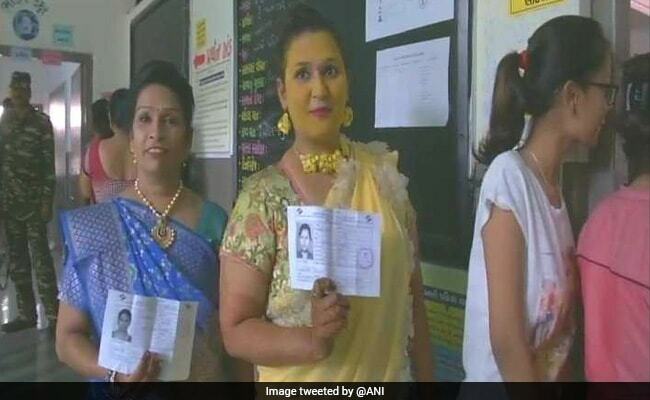 A bride to be, Fenny Parekh, takes a break from her haldi ceremony to cast her vote at a polling station in Surat, news agency ANI reported. 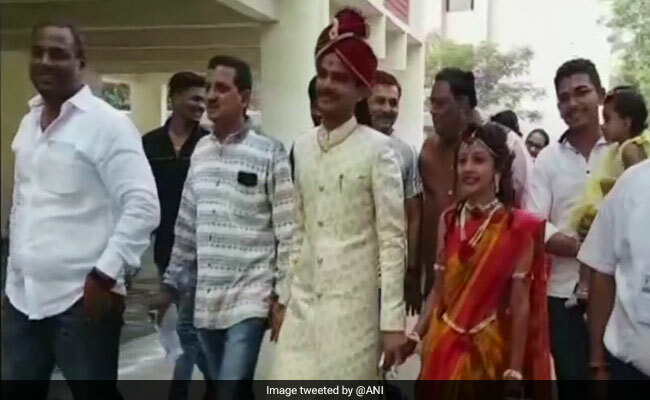 Earlier in the day, a couple was seen going to a polling station in Bharuch to cast their vote in the Gujarat assembly election 2017 before their wedding ceremony. 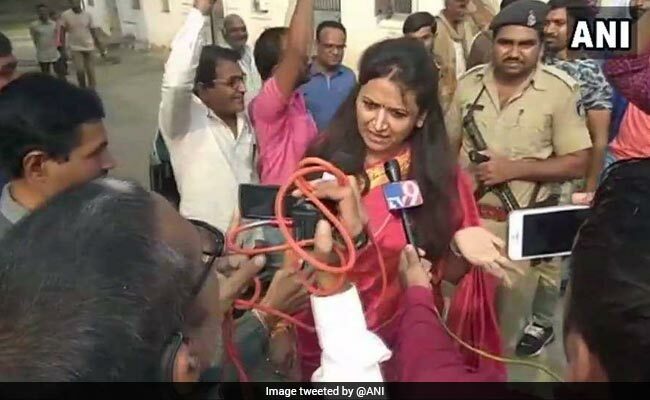 One complaint of Bluetooth being used inside a polling station in the first phase of the Gujarat assembly election 2017 came from the Congress in Porbandar, Gujarat Chief Electoral Officer BB Swain told NDTV. Mr Swain said the district collector went there to look into the matter. Preliminary inquiry shows that a polling agent's phone was showing that Bluetooth was on. It has been dealt with, Mr Swain said. Other complains about EVMs malfunctioning were during mock polls, and now all have been restored, he said. Gujarat traders, who form the core of Prime Minister Narendra Modi's support base, have complained that the Goods and Services Tax introduced this year and late last year's shock move to abolish Rs 500 and Rs 1,000 rupee bank notes, accounting for 86 per cent of cash in circulation, aggravated already tough economic conditions, news agency Reuters reported. 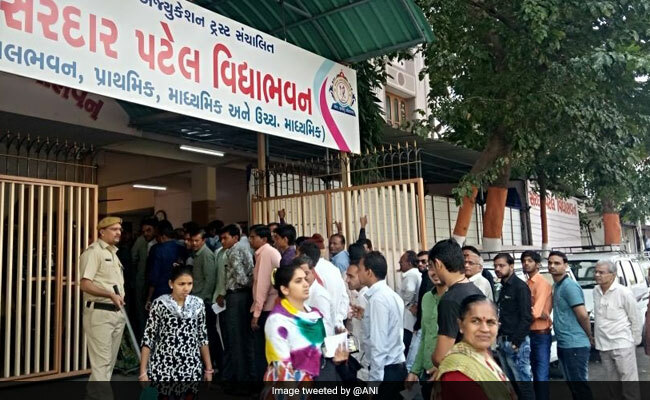 In Surendranagar, voters started turning up early in the morning and some had to wait for about 15 minutes due to a malfunction in the electronic voting machine, news agency Reuters reported. 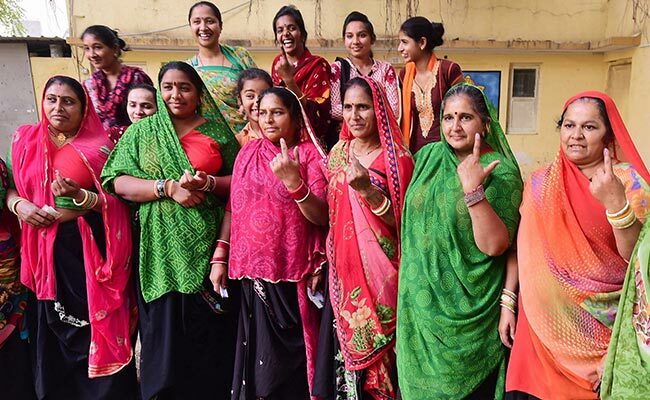 In the first few hours, more than 15 per cent of voters in Surendranagar district cast their ballot, according to state government officials, Reuters reported. 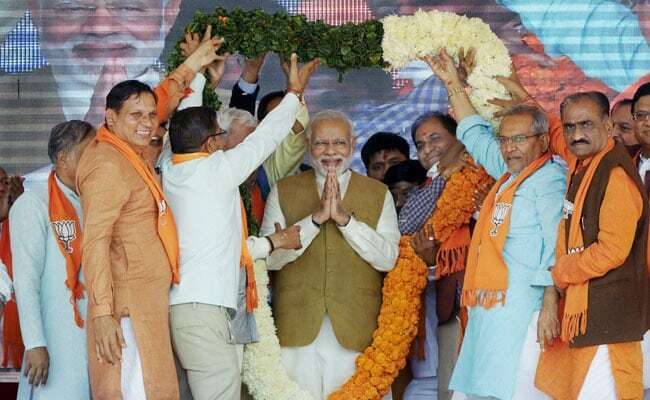 Prime Minister Narendra Modi has thrown himself into the campaign, addressing dozens of rallies over the past month. Lalu Prasad tweets "Why repeated snags..."
After some electronic voting machines malfunctioned in Surat in the Gujarat assembly election 2017, Rashtriya Janata Dal leader Lalu Prasad tweeted, "Why repeated snags & lapses inspite of repeated complaints? What EC is doing for long? Whenever there are EVM glitches/errors why it's advantage BJP? WHY?WHO WILL RESPOND?" The Election Commission said the faulty EVMs in Surat have been replaced. 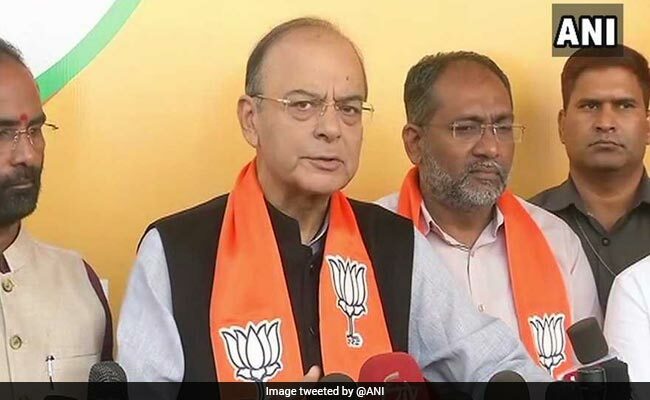 Finance Minister and BJP leader Arun Jaitley today said the party will see a big win in Gujarat as people in the home state of Prime Minister Narendra Modi vote in the first phase of the Gujarat assembly election 2017. "This will be a landslide victory for BJP and the win will be resounding. Congress's campaign tactics have failed," Arun Jaitley said. He said he wants voting to be smooth and there is a paper trail along with EVMs or electronic voting machines. "Voters have made up their mind months in advance," Mr Jaitley said. The Election Commission said all electronic voting machines in Surat are working now. The number of the replaced units is: ballot units (29), control units (40) and VVPAT (166). The Election Commission said there are over 24,000 polling booths in the first phase of the Gujarat assembly election 2017. The EMVs that malfunctioned were reported from some seven-eight polling stations, the EC said. Omar Abdullah tweets on "trustworthiness of voting machines"
After some electronic voting machines or EVMs malfunctioned in Surat in the Gujarat assembly election 2017, former Jammu and Kashmir chief minister Omar Abdullah tweeted that "I've been extremely sceptical of EVM related conspiracy theories but I'm being to question my unwavering faith in the machines & their infallibility." I hope the Election Commission can step up & address the questions that are being asked of it about the trustworthiness of voting machines. He said, "I hope the Election Commission can step up & address the questions that are being asked of it about the trustworthiness of voting machines." The Election Commission today said the faulty EVMs have been replaced. 4,397 EVMs have been deployed in Surat's 16 seats (12 in urban and four in rural) in the Gujarat assembly election 2017. Some electronic voting machines or EVMs were reported faulty in Surat, an area seen as strategically vital in this election because it is dominated by the Patels, a caste seen as upset with the ruling BJP which has governed Gujarat for 22 years in a row. The Election Commission said the faulty EVMs have been replaced. The malfunctioning EVMs were placed in 16 rural and urban constituencies of Surat, seen as a stronghold of Patidar quota agitation Hardik Patel. Mr Patel has asked the influential Patidar or Patel community to reject the BJP for failing to extend affirmative action policies to them. A group of Patidars protest as BJP's Reshma Patel arrives to vote in Junagadh in the Gujarat assembly election 2017, news agency ANI reported. Reshma Patel is a former Patidar Anamat Andolan Samiti or PAAS convenor who later joined the BJP. She was opposed by many PAAS supporters when she went to cast her vote in Jhanjharda village in Junagadh district. Voting in Prime Minister Narendra Modi's home state of Gujarat is a key electoral test of his popularity after a series of controversial economic reforms, news agency AFP reported today. AFP said PM Modi built his reputation as an economic reformer in Gujarat which boomed under his rule, attracting investments from around the globe. But his recent reforms -- a new national tax and a shock currency ban to fight graft -- have hit India's growth and hurt the very constituency of traders and small business owners who were his biggest supporters in the western state, polls found, the news agency AFP reported. The Election Commission has received complaints of electronic voting machine or EVMs malfunctioning in Kosamba region of Valsad district, new agency IANS reported. A Congress candidate from Pardi has filed a complaint with the EC for a Voter Verification Paper Audit Trail or VVPAT not showing the paper slip while voting, IANS reported. Voting was boycotted by villagers in Kalyanpur in Jam Jodhpur constituency over not getting proper water supply in the region. 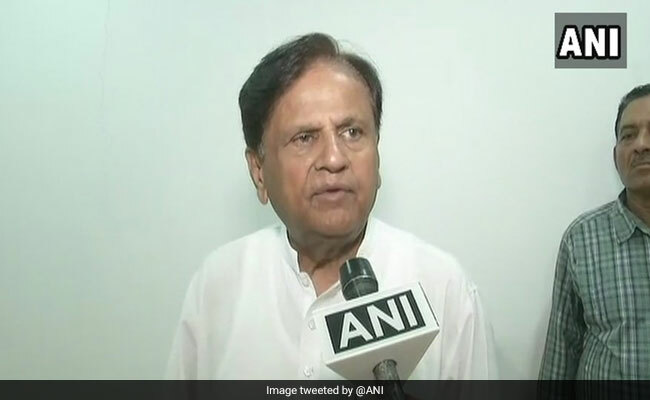 After some electronic voting machines or EVMs malfunctioned, some of which were soon replaced, Congress leader Ahmed Patel said the "BJP is an opportunist" who "can do anything to be in power." 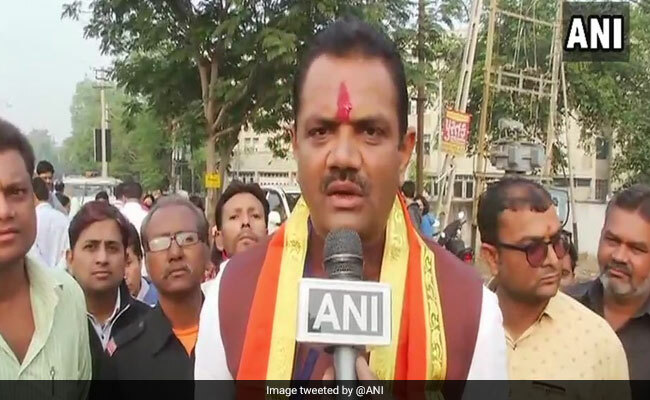 The Congress leader, who voted in Bharuch's Ankleshwar in the Gujarat assembly election 2017, said the party will win over 110 seats in the home state of Prime Minister Narendra Modi. The BJP has ruled Gujarat for 22 years. 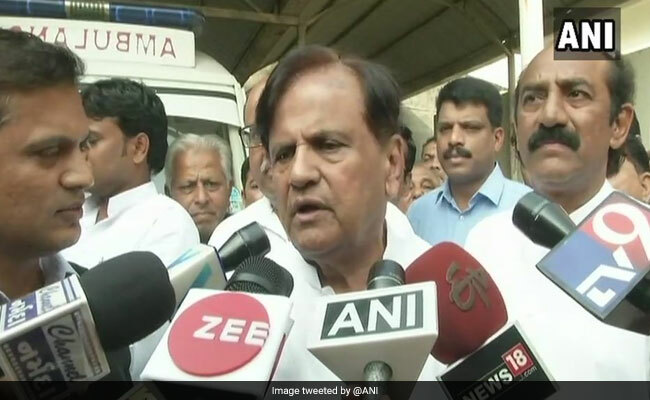 "Wherever there are complaints of EVM malfunctioning, it should be dealt with immediately," Ahmed Patel told news agency ANI. 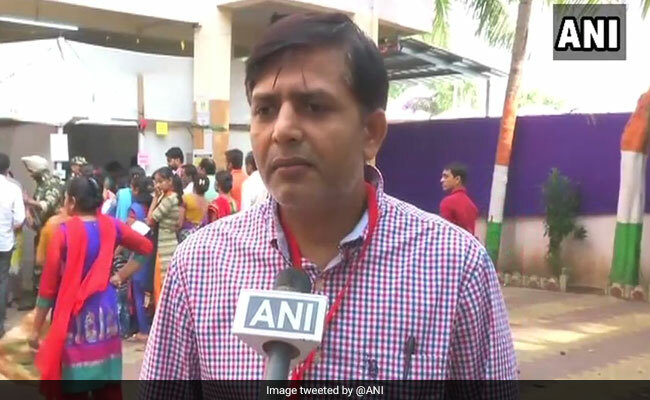 "Have replaced two machines and one VVPAT, you cannot really call it a technical error, these are electronic items there can be some issues," Vipul Goti, Master Trainer of the Election Commission in Surat's Varaccha told news agency ANI. "Now everything is okay and voting has started," Mr Goti said. After reports came that some EVMs have malfunctioned in Surat in the Gujarat assembly election 2017, the Election Commission said faulty electronic voting machines are being replaced immediately. The election watchdog said faulty EVMs have already been replaced in some polling stations. The EVMs malfunctioned in seven-eight polling stations, the Election Commission said. The election regulator said there are a number of EVMs in reserve and officials are checking for any fault. Some electronic voting machines or EVMs have malfunctioned in Surat in the Gujarat assembly election 2017. The faulty EVMs have been deployed at the 16 seats - 12 in Surat (urban) and four in Surat (rural). Some of the EVMs have been restored, officials said. The total number of EVMs to be used in the first phase of the Gujarat assembly election 2017 is 27,158 and the total number of polling stations is 24,689, according to the Election Commission. Congress leader Ahmed Patel has cast his vote in Bharuch's Ankleshwar in the Gujarat assembly election 2017. "Congress will win more than 110 seats," Ahmed Patel said after casting his vote, news agency ANI reported. Ahmed Patel had snatched a late-night victory in the Gujarat Rajya Sabha elections after the Election Commission rejected the votes of two Congress rebel legislators. Mr Patel won by the skin of his teeth. He needed 44 votes to win and he got 44, returning to the Rajya Sabha from Gujarat for a fifth term. Some electronic voting machines have malfunctioned in Surat in voting for the first phase in the Gujarat assembly election 2017. Some of the EVMs have been restored to working condition now. Surat -- Gujarat's diamond city and the epicentre of the Patidar quota agitation -- is seeing a tough electoral battle as the Congress has added the face of the Patidar agitation Hardik Patel to its arsenal this time. 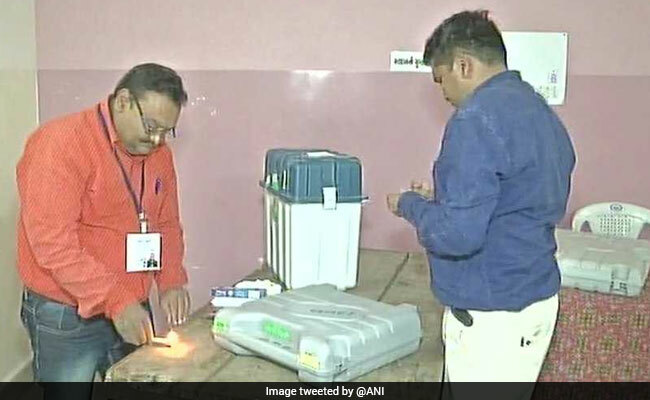 The faulty EVM in Sardar Patel Vidyalaya booth in Surat's Varaccha has been replaced, news agency ANI reported. Cricketer Cheteshwar Pujara has cast his vote in Rajkot's Ravi Vidayalaya polling station in the Gujarat assembly election 2017. Chief Minister and BJP leader Vijay Rupani is contesting from Rajkot West. This constituency is said to be a "safe" seat for the ruling BJP which has been representing it since 1985. He is facing a challenger in Congress' Indranil Rajyaguru. Out of 3.15 lakh voters in the constituency, the number of Kadva and Leuva Patidars is the highest at 62,000, followed by Brahmins, Lohana and Jain communities. 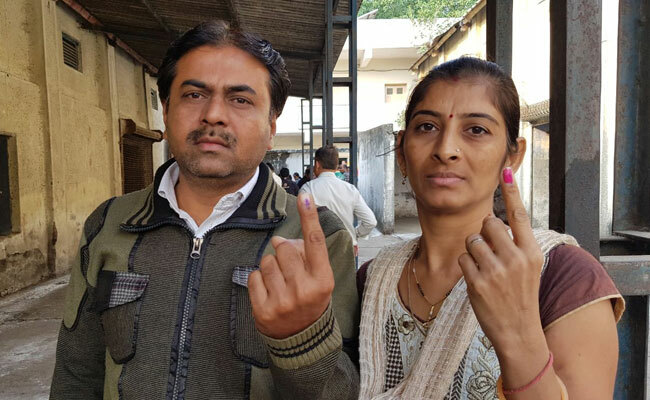 A couple comes to a polling station in Bharuch to cast their vote in the Gujarat assembly election 2017 before their wedding ceremony. The Bharuch assembly constituency is one of the largest industrial areas including Ankleshwar GIDC and it is sometimes called the chemical capital of India. In the 2012 Gujarat elections, BJP's Dushyantbhai Patel won from this seat while Congress's Sandip Mangrola could not win. Patel Dushyantbhai Rajnikant of BJP is fighting the Gujarat assembly election 2017 against Patel Jayeshbhai Ambalal of the Congress. Polling is underway in the politically crucial Surat area in south Gujarat, which has 12 seats. One of the voters there is a first-time voter, who said "my experience has been very nice. 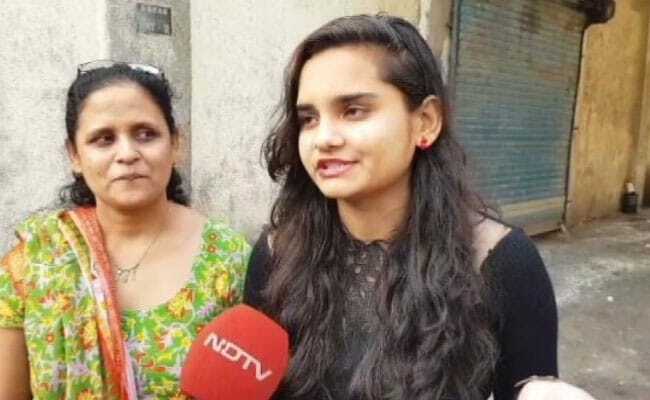 I always tell other people, go out and vote..." The mother of the medical student told NDTV that her daughter has been excitedly saying for the last two days "I'm going to vote!". 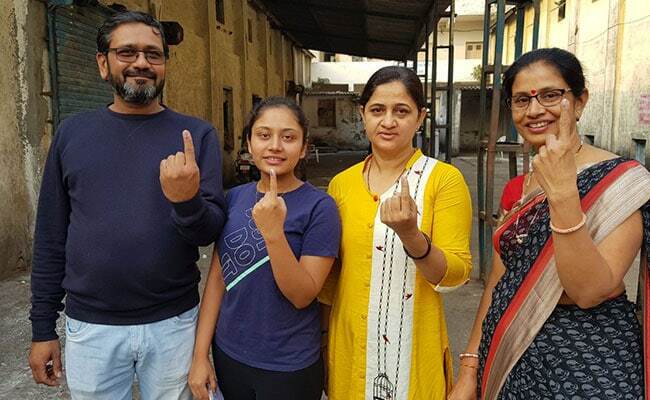 There is visible excitement among first-time voters in Surat. BJP Gujarat chief Jitu Vaghani and Chief Minister Vijay Rupani were among the first to vote in the first phase of the Gujarat assembly election 2017. 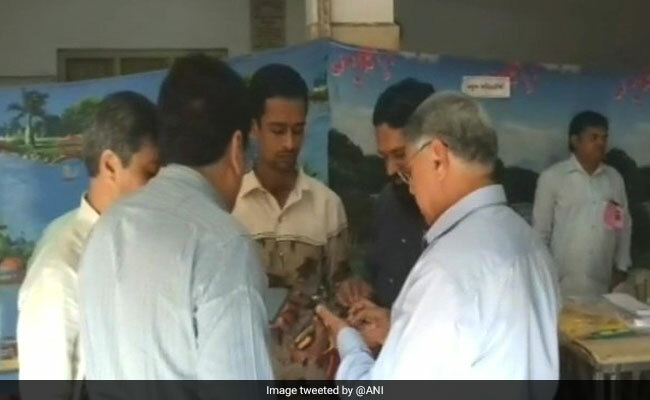 Mr Vaghani cast his vote in Bhavnagar, some 15 minutes after polling began. "BJP has moved forward with a vision of new India, new Gujarat... The mood of the people is towards BJP and I thank them," he said after casting his vote. 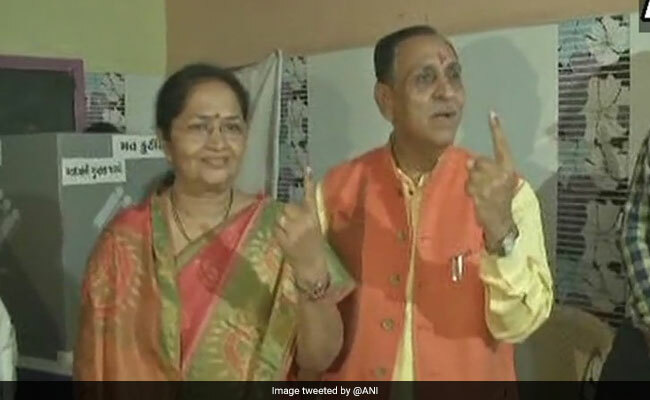 Vijay Rupani was accompanied by his wife Anjali Rupani, and he voted in Rajkot. The Gujarat chief minister is facing Congress's Indranil Rajyaguru from Rajkot-West seat, which is perhaps the most-watched contest today in the heart of Saurashtra. The Gujarat assembly election 2017 is being held in two phases in Prime Minister Narendra Modi's home state. The second phase will be fought on 93 seats in north and central Gujarat. The votes will be counted on December 18. PM Modi and Rahul Gandhi, who will soon take charge of the party, have led aggressive campaigns in Gujarat. A poll of opinion polls, which took data from three separate surveys, shows the BJP winning Gujarat again, but by a smaller margin than last time. The BJP has been in power in Gujarat for the last 22 years. Jitu Vaghani, the BJP's candidate on the Bhavnagar West seat in the Gujarat assembly election 2017, said, "We are going to win 150-plus seats under the leadership of PM Modi ji, we face no obstacles." In Amreli and Bhavnagar -- located in the politically important Saurashtra region -- farmers, most of them Patidars, have said they are upset with the government over crop losses. Prime Minister Narendra Modi today asked the people of Gujarat to turn up in large numbers to cast their vote in the Gujarat assembly election 2017. He asked the youth of the state to cast their vote to elect their new government. "Phase 1 of Gujarat polls begin. Urging all those voting today to turnout in record numbers and vote. I particularly call upon youngsters to exercise their franchise," Prime Minister Narendra Modi tweeted. According to the Election Commission, over two crore people are eligible to cast their vote in the first phase of the Gujarat assembly election 2017. Gujarat Chief Minister and BJP leader Vijay Rupani has cast his vote at a polling booth in Rajkot in the Gujarat election 2017. Gujarat's Rajkot-West seat has been a BJP stronghold and is considered safe for the ruling BJP, which has been representing it since 1985. But this time the elections in this constituency could heat up with Vijay Rupani facing Congress leader Indranil Rajyaguru, the legislator (MLA) from Rajkot East and who is also the richest candidate in the Gujarat election 2017. People show their inked fingers after casting their vote in Surat's Majura in the Gujarat assembly election 2017. Bharatiya Janata Party (BJP) legislator (MLA) Harsh Sanghvi is contesting against Congress's Ashok Kothari. This seat was formed after the 2008 delimitation. As the commercial capital of Gujarat, Surat has always been high-maintenance for politicians. But in this election, when it is seen as reviewing its steadfast loyalty to the BJP, its political intensity has peaked. As voting started in the Gujarat assembly election 2017, Congress vice president Rahul Gandhi tweeted that the participation of voters is the "soul of democracy". "I welcome the young voters who are exercising their franchise for the first time. I appeal the people of Gujarat to vote in large numbers and make this celebration of the democratic festival successful," said Rahul Gandhi, who is set to become Congress chief soon. The battle for the 12 seats in Surat, the diamond and textile hub and a BJP stronghold, is being seen as a referendum on the notes ban and new national tax GST. Congress vice president Rahul Gandhi has urged traders to punish the BJP, alleging that its mega reforms have brought small business to their knees. 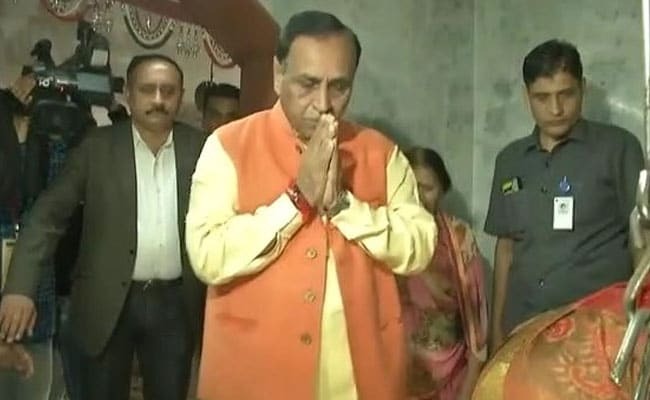 Gujarat Chief Minister and BJP leader Vijay Rupani has arrived at a polling booth in Rajkot West to cast his vote in the Gujarat election 2017. Gujarat's Rajkot-West seat has traditionally been a BJP fortress and considered safe for the ruling party, which has been representing it since 1985. This time, however, the elections in this constituency could get exciting with Chief Minister Vijay Rupani facing a challenger in Congress' Indranil Rajyaguru, the sitting MLA from Rajkot-East and the richest candidate in the Gujarat election. 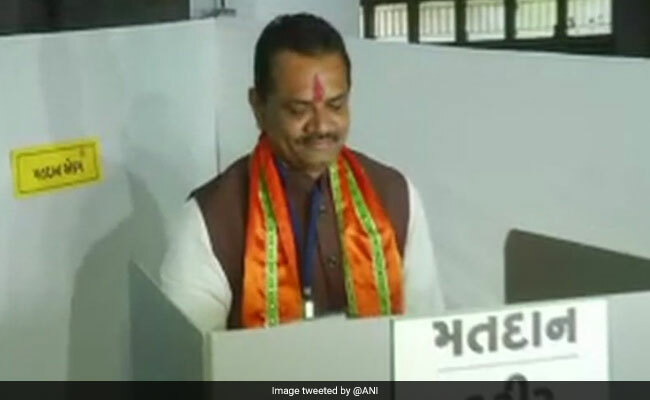 BJP Gujarat chief Jitubhai Vaghani casts his vote in Bhavnagar. In 2012, the BJP had swept the elections in this cotton and groundnut belt, which contributes to as much as 35 per cent of the state's production. In Amreli, it won five of the six seats. In Bhavnagar, it won eight of the nine seats. But poor rain and bollworm attack has taken a heavy toll on the cotton crop this year. On top of it, the minimum support price or MSP for cotton and groundnut has resulted in huge losses, farmers say. Voting for the first phase of the Gujarat assembly election began at 8 am on 89 seats of Saurashtra and south Gujarat regions. The election is viewed as a prestige battle for Prime Minister Narendra Modi and a litmus test for the leadership of soon-to-be Congress chief Rahul Gandhi, news agency PTI reported. While PM Modi addressed some 15 rallies, Rahul Gandhi spent more than seven days in Saurashtra and south Gujarat, addressing a number of meetings. Today's most-watched contest in the Gujarat election is in Saurashtra in Rajkot West, where legislator and Gujarat Chief Minister Vijay Rupani battles it out with the Congress's Indraneel Rajyaguru. 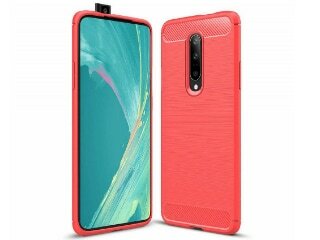 Other major contests feature senior minister Babubhai Bokhiria, the Congress' Arjun Modhwadia and former Finance and Power Minister Saurabh Patel. The BJP has fielded candidates with 22 criminal cases in the first phase of the Gujarat assembly election, while the rival Congress has fielded 31 candidates who have criminal cases filed against them. Four candidates of the Nationalist Congress Party (NCP) have criminal cases against them, while two candidates of the Aam Aadmi Party (AAP) are facing criminal cases. People have started voting in the Gujarat assembly election 2017. Polling will end at 5 pm today. As people headed to polling stations, Gujarat Chief Minister Vijay Rupani said, "People should come out in large numbers to vote. We are very confident, no question of any challenge." Voting for the first phase of Gujarat elections will begin soon, at 8 am. Security personnel seen conducting last minute checks at a polling booth in Piraman village in Bharuch's Ankleshwar. The smallest assembly constituency by size in Gujarat in the first phase is Karanj at 4 square kilometres; the largest is Abdasa at 6,278 sqkm. The constituency with the least number of voters is Surat North with 1,57,250, and the highest number of voters is in Kamrej with 4,28,695, according to the Election Commission. The maximum number of candidates in a single constituency in the first phase of the Gujarat election 2017 is at Jamnagar Rural, where 27 candidates are contesting. The least number of candidates in a single constituency is in Jhagadia (ST) and Gandevi (ST) with only three candidates each, according to the Election Commission. Out of the total 977 candidates contesting in the first phase, 920 are men and 57 women. Some of the prominent candidates in the first phase of Gujarat election 2017 include Chief Minister and Bharatiya Janata Party's (BJP) Vijay Rupani (Rajkot West), and Congress's Shaktisinh Gohil (Mandvi) and Paresh Dhanani (Amreli). According to the Election Commission, 2.12 crore people are eligible to vote in the first phase of the Gujarat assembly election. The Election Commission has deployed 27,158 electronic voting machines or EVMs in the first phase of the Gujarat election. The total number of polling booths in the first phase is 24,689. Prime Minister Narendra Modi has tweeted on the first phase of the Gujarat elections. In the tweet, he said "Phase 1 of Gujarat polls begin. Urging all those voting today to turnout in record numbers and vote. I particularly call upon youngsters to exercise their franchise." People in 89 assembly constituencies in Saurashtra and south Gujarat regions will vote in the first phase. Voting will start at 8 am and end at 5 pm. A total of 977 candidates will contest in the first phase of the Gujarat assembly elections. The BJP has been in power in Gujarat for the past 22 years.